Any quantity only $7.99 per round over spot! Life presents us with a variety of obstacles and hurdles that we must overcome. In some cases, these roadblocks are presented as doors that we must choose to either try and open, or leave shut forever while we wonder what could have been with a little more effort. The new Through That Door Series from the North American Mint and Chautauqua Silver Works presents this struggle with different silver round designs. 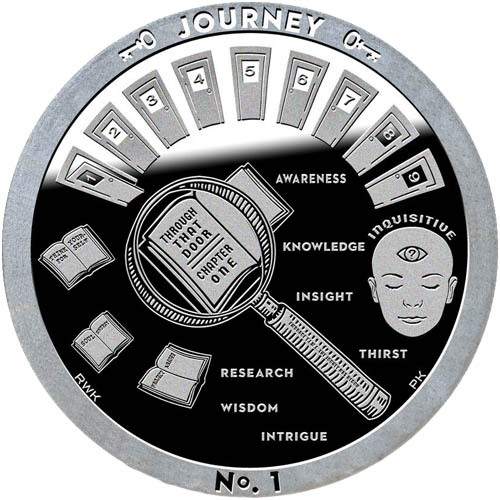 Today, 1 oz Silver Through That Door Series Journey No. 1 Rounds are available to you online at Silver.com. Available to ship inside of individual capsules! First design issued in the Through That Door Series! On the obverse are the doors of the Through That Door Series with design elements reflecting the quest for knowledge and wisdom. 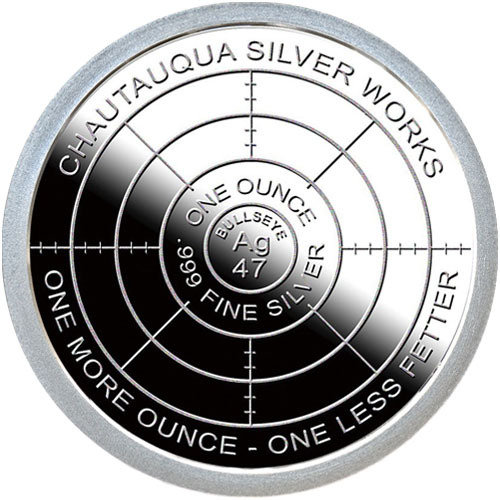 The reverse includes Chautauqua Silver Works’ logo. The first round in the Through That Door Series presents one of the most common quandaries humans face. When we come to doors in our life that are blocking our way to the other side, it is often the inquisitive nature of human beings that pushes us to open that door and dare to pass through to the other side. All of these 1 oz Silver Through That Door Series Journey No. 1 Rounds are available to you with individual protective capsules and come from a series that includes limited mintage figures for each of the unique designs. All silver rounds in this collection will share the same reverse design with a different obverse image per release. On the obverse of Through That Door Series Journey No. 1 Rounds are design elements that point to the most common reason we push through doors. Human beings are inquisitive creatures. We constantly seek greater knowledge, insight, and wisdom, and a combination of intrigue and research will get us to the answers we seek. The design element includes an arrangement of nine doors along the top, the first of which has been opened already by an inquisitive mind. Please feel free to reach out to Silver.com with your questions. You can call us at 888-989-7223, chat with us live online, or simply send us an email.